By Prayer is SIM’s motto because it is truly by prayer that we praise God, seek His direction, request resources, and call upon the Holy Spirit to empower our ministries. By Prayer is a call to action emphasizing important work to be done. We must intercede for those living outside of a saving relationship with Jesus, many of whom have never heard His name. Finally, By Prayer is a celebration! We glorify the Lord not only for all that He has accomplished, but for who He is and all that He is yet to do. We would be honored if you joined us in praying for SIM ministries and workers around the world. The following resources are designed to inform, inspire, and invite you to stand with us in prayer as we bring good news to hard places. 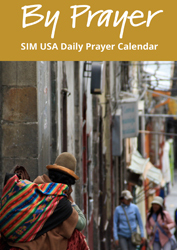 By Prayer is a daily prayer calendar created by SIM USA that features ways to pray for SIM workers and ministries around the world. The SIM Prayer Guide features countries around the world where SIM is currently working. Each day, you’ll learn about the types of ministry SIM does in each country, as well as the communities where Jesus is least known, and ways you can pray specifically for the work there. 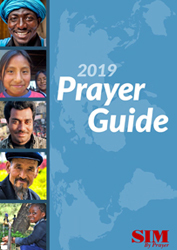 The entire guide can be prayed over in a one-month rotation (see Prayer Calendar, pg 4), or at a pace of your choosing.